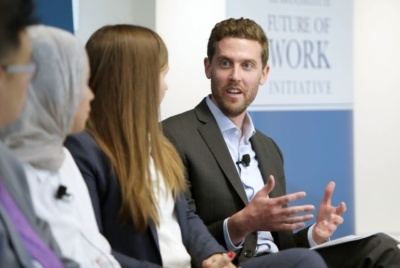 Last week, the Future of Work Initiative hosted an event at the Aspen Institute in Washington, DC to discuss the financial health of the millions of Americans who work as freelancers, independent contractors, and solo entrepreneurs. While these work arrangements can offer flexibility, they also present unique challenges for this segment of the workforce. Independent workers lack employer-provided benefits, face complex tax filing requirements, often experience income volatility, and have difficulty saving for the future. In addition to better understanding these challenges, the event explored creative solutions from both the public and private sectors. Congressman Jim Himes delivered keynote remarks on the issues facing American workers in the 21st century and the structures that could be put in place to help all workers achieve upward mobility. “The problem here is one that is going to require a focus on the politics and legislation, it’s going to require the private sector to be at least open minded—but hopefully aggressive in thinking forward about what we need in the generations to come—, and even the philanthropic sector,” noted Congressman Himes. 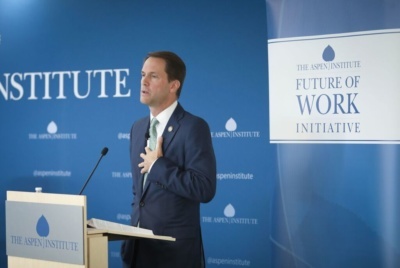 “This is a problem to be solved in real collaboration.” In discussing the role of the public sector in modernizing work-related benefits, Congressman Himes said, “It will require legislative change. We somehow need to find a way to update a lot of the incentives that were created–in the 30s for the most part–around the provision of benefits to help with the concept of portability, of universality, of having some innovation.” At the event, Congressman Himes, who chairs the New Democrat Coalition, mentioned that the Coalition’s Future of Work Task Force recently released their Economic Opportunity Agenda: A Future that Works and will release a second report on portable benefits this year. Congressman Himes is also a co-sponsor of portable benefits pilot legislation, which was introduced in May 2017. Following Congressman Himes’ remarks, Yuki Noguchi of NPR moderated a panel featuring David Mitchell of the Aspen Institute Financial Security Program, Kosar Jahani of Samaschool, Duke Chang of bSolo, Shelly Steward from the Future of Work Initiative, and Sarah Bailey, an independent consultant who shared her personal experience. 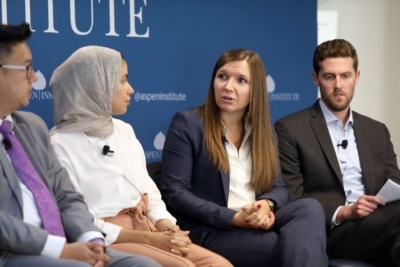 The panel discussion covered some of the key challenges facing independent workers and explored a variety of potential solutions for addressing the financial security of this segment of the workforce. Panelists also discussed different portable benefits models, which decouple benefits–including healthcare, retirement, disability insurance, and more–from employment. These models have been proposed by many as one set of potential solutions to expand access and security to all workers, regardless of work arrangement. Retirement is one benefit that can be made more portable to meet workers’ needs. David Mitchell told the audience, “On the long-term asset-building side, something that we’re watching pretty carefully are state-initiated retirement plans.” Mitchell pointed to Oregon’s intention to extend their OregonSaves retirement savings program to self-employed workers as one example. 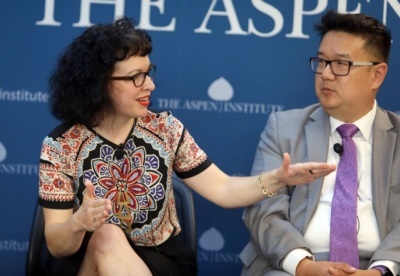 As another model for providing work-related benefits to independent workers, moderator Yuki Noguchi spoke about the Black Car Fund, which has provided for-hire drivers in New York with workers’ compensation insurance, and recently expanded to include telemedicine and vision benefits. Funded by a 2.5 percent consumer surcharge on all for-hire rides, the Black Car Fund provides a model for benefits that could be both expanded to new areas and replicated in additional industries. Through the discussion of benefits for independent workers, panelists mentioned many examples of innovative models that could provide access to critical supports for these workers. Several organizations in the private sector have also taken on the role of designing tools for independent workers. 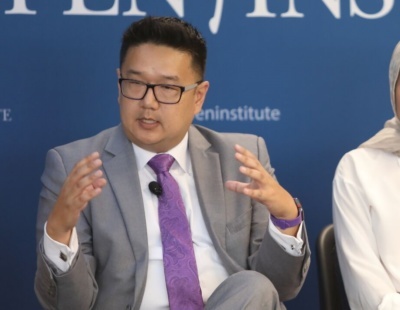 In discussing the work of bSolo, Duke Chang shared, “there’s a lot of startups and other organizations that are starting to do something about this because everyone’s starting to see this ground swell of people in this workforce and see the needs that they have.” For example, through interviews with hundreds of independent workers, Chang and his team learned that challenges forecasting future tax payments can be a barrier to long-term savings and began developing a product to help meet that need. In reflecting on new innovative models, Steward shared, “what’s important about them from a broader scalability perspective is not any one of these examples, but the fact that there’s experimentation happening–that people are looking into what does and doesn’t work.” Steward pointed to Alia, which is a platform to facilitate portable benefits for domestic workers, developed by Fair Care Labs, the social innovation arm of National Domestic Workers Alliance. Independent workers often struggle to access training opportunities, which can keep skills up-to-date and help prepare workers for new opportunities in a changing economy. 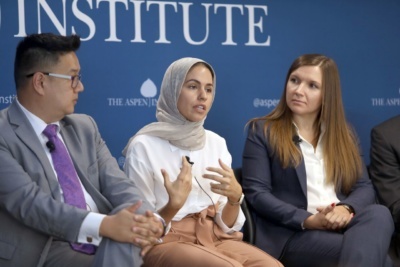 Kosar Jahani explained how independent contractors often struggle to build their technical skills and confidence, because they lack the support and resources of a traditional employer. Jahani described some of the “soft skills” training provided by Samaschool, a San Francisco-based nonprofit that aims to prepare low-income populations to succeed as independent workers. 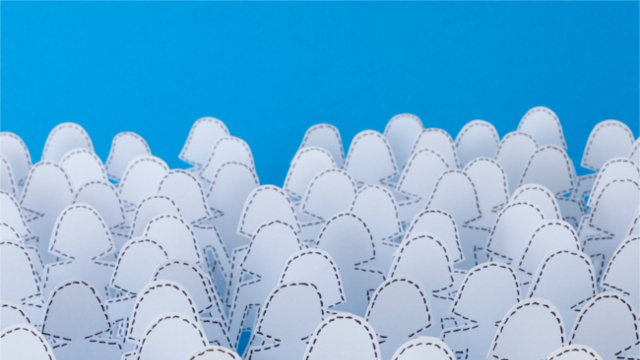 This training–covering topics such as client management, client acquisition, personal branding–is not typically taught in federal jobs programs, but nonetheless is critical to independent workers. In discussing the current landscape of training, Jahani noted that “Workforce development organizations don’t tend to provide training opportunities to independent workers, because they’re quite frankly not incentivized or resourced to do it.” While independent organizations like Samaschool are seeking innovative ways to provide training to independent workers, there is also room for policy to address this need. The challenge of training, like many of the dilemmas facing workers in the 21st century, can be addressed across sectors. 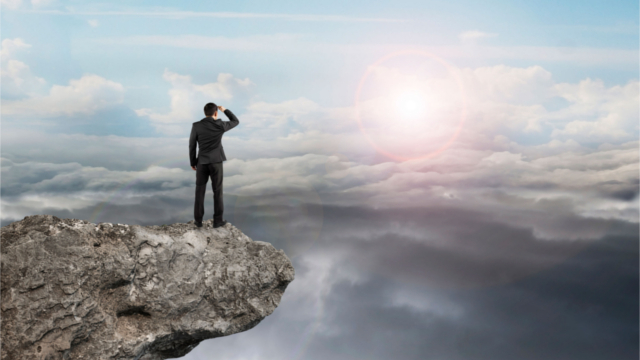 Freelancers, independent contractors, and solo entrepreneurs face unique financial challenges. Many parties are exploring new ways to help workers in nontraditional arrangements overcome financial barriers, gain access to critical benefits and protections, and develop skills throughout their careers. The event highlighted the opportunity for policy and private sector innovation to support workers in today’s economy. You can view a video recording of the event here.